Haleigh Cummings disappeared from her mobile home in Florida nearly a year ago. (CNN) -- The father of missing child Haleigh Cummings and his ex-wife have been arrested on drug-trafficking charges in Florida, authorities said. Ronald Cummings, 26, faces three counts of trafficking prescription medication -- including Oxycodone and Hydrocodone. He is being held in jail on $500,000 bond, the Putnam County Sheriff's Office said. Misty Croslin, 18, faces six counts of trafficking prescription medication and is jailed on $950,000 bond. The former couple was arrested Wednesday along with three others after allegedly selling about $3,900 worth of drugs to undercover officers, sheriff's officials said. Cummings, Croslin and the others made brief court appearances Thursday morning, said Lt. Johnny Greenwood. But the court clerk's office said it had not yet received information about whether they had been assigned attorneys. An undercover investigation was launched after authorities received information about suspected drug dealing, Greenwood said. He added that this probe was separate from the investigation into Haleigh's disappearance. "Even though these are totally separate, they are parallel cases, and there's no doubt in my mind these cases will cross some day," Greenwood said. "I hope that somewhere through this, the investigators in the Haleigh case will find the information they need." Two of the counts against Croslin are felonies that carry mandatory 25-year sentences if she is convicted, Greenwood added. 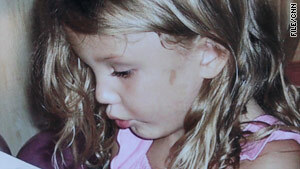 Haleigh Cummings, then 5, vanished February 9 from the couple's Satsuma, Florida, mobile home. Misty Croslin was the last person known to have seen Haleigh the night she disappeared. She said she tucked Haleigh and her 4-year-old brother into bed about 8 p.m. and went to sleep herself two hours later. She awoke at 3 a.m. to find the girl missing and a cinder block propping open a back door. Ronald Cummings called police and reported his daughter missing when he returned from work at dawn. The Putnam County Sheriff's Office said in August that "the evidence and investigatory effort has minimized the likelihood that Haleigh's disappearance is the work of a stranger." Ronald Cummings and Crystal Sheffield, Haleigh's mother, are not considered suspects, police said. Investigators said in a statement last August that they believe Croslin "continues to hold important answers in the case" but has not provided "any sort of detailed accounting of the hours during the late evening and early morning of Haleigh's disappearance." Investigators also said that physical evidence contradicts Croslin's account. Croslin has not been named a person of interest or suspect in Haleigh's disappearance. In televised interviews, she has said she does not know what happened to the little girl but believes "the other side of the family" knows where she is.